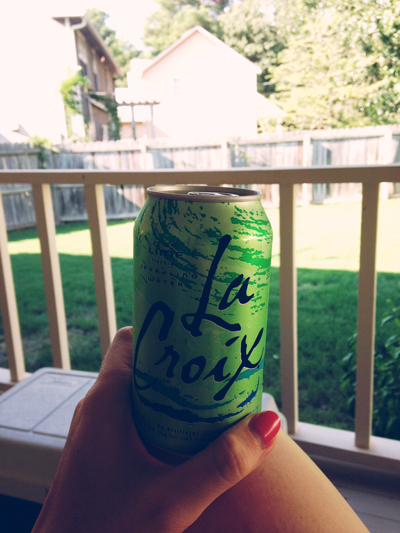 Summer Favorites | mrs. and the misc. I feel like summer is slipping through my fingers with all this talk about school starting (FYI for the first time in our marriage Matt is NOT starting school this fall… woohoo!) and this amazing fall like weather. Don’t get me wrong I LOVE the fall. I can’t wait for pumpkin lattes, mums on my front porch and college football but that’s for a different post. Today I want to talk about some of my favorites things from this summer. 1. 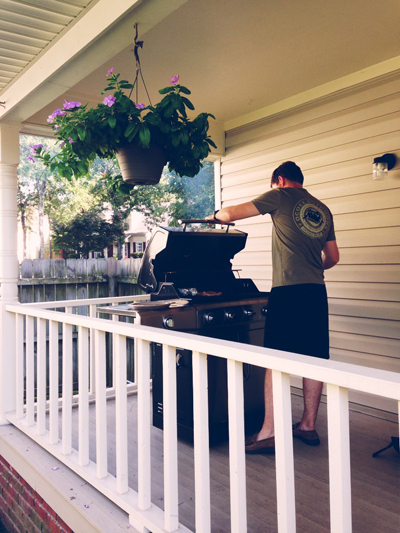 Grilling: Every house needs some kind of grill, right?! Well since we’ve been in an apartment the past 4+ years we’ve been holding out on a proper grill till now. We found a great deal on one at Home Depot and use it several times a week. And lucky for me Matt has seriously mastered the perfect grilled chicken, steak and burgers. I’m not even kidding. I’m going to be sad when it’s too cold to eat like this for dinner every meal. 2. 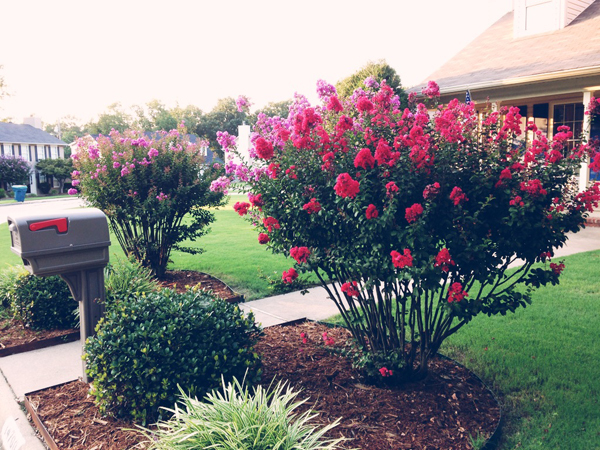 Crepe Myrtles: Also since buying house and learning about the world of keeping up with a lawn I have fallen in love with Crepe Myrtles. Pictured above are the beautiful ones in front of our house. I love laying on our bed or sitting on our front porch swing (when it’s a little cooler) and just staring at all the pretty colors. But really I’m not just a fan of my own Crepe Myrtles, I love seeing these colorful trees all over town! 4. Fresh produce: Summer can bring some incredibly hot heat but the gift of fresh produce almost makes it worth it. Just as I mentioned above about our love for grilling this summer it also goes with our love to grill or roast summer veggies. We love tomatoes, corn, squash, zucchini, okra, bell peppers, cucumbers and probably whatever else you put in front of us. Thankfully we’ve gotten most of our produces from either our neighbor’s garden (who also happens to be our pastor and his wife) or my in-laws garden. 5. 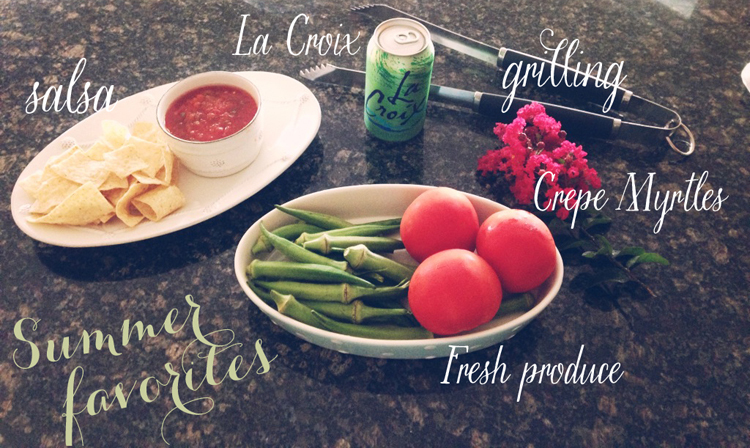 Salsa: I make Pioneer Women’s restaurant salsa about once a week. It makes a big batch and it’s my go-to snack. I’ll tweak her recipe here and there with making it a little warmer but it’s a definite staple to my summer eating. Summer is almost gone so be sure to enjoy those things you love most about summer while you still can!